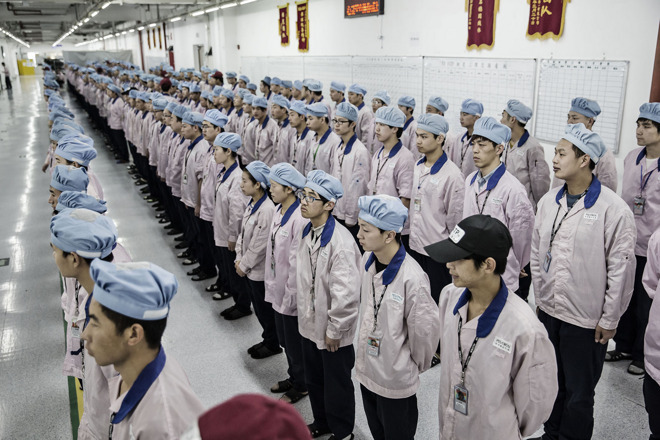 One of Apple's iPhone manufacturers, Pegatron, is still seeing its labor force put in excessive overtime —something unfortunately necessary for workers to meet basic financial needs, according to China Labor Watch. Between September and October 2015 the advocacy group said it collected 1,261 pay stubs showing evidence of extreme overtime, a Bloomberg report noted on Monday. Pegatron has insisted that China Labor Watch miscounted, as that period included state holidays, when pay was three times standard. The latter organization countered, however, by saying it has collected another 441 pay stubs since March pointing to the same conclusion. Pegatron now uses a complex system of face scanners, badges, and iPads to track punch-ins, something nominally intended to comply with multiple standards —including Apple's, which limit workers to 60 hours per week. Pegatron said it follows Electronic Industry Citizenship Coalition guidelines, which limit overtime to 80 hours per month. Chinese law normally limits overtime to 36 hours per month, but Pegatron states that it's officially exempt. In its Supplier Responsibility Report for 2015, Apple claimed that following 640 audits of the supply chain, compliance with its hourly standards was at 97 percent. Activist groups have argued though that suppliers can sometimes pull deceptive tactics when an audit is incoming. Both Pegatron and Apple's main manufacturing partner, Foxconn, have come under regular scrutiny in the past several years. Activist groups and media reports have called attention to issues including not just poor wages and excessive hours, but underage labor, terrible dorm conditions, and lax safety standards. While the situation has generally improved —partly due to companies like Apple responding to the media —problems have not been fully stomped out.